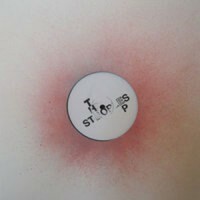 The Steoples is a collaboration between Gifted & Blessed (Wild Oats/GB) and A Race of Angles, who recently recorded an EP for Theo Parrish's Wildheart Recordings. "Nature Of The Soul" will be getting nuff praise from Giles Peterson I reckon, its lush organics and neo-soul vibe set around the house template heading right up his strasse. "Got To Be Right" uses similar soulful male vocals bouncing against a house beat. This one intricately weaves some radiating synth lines and bubbling sonics into the mix though, making for a slightly more melancholic, if none the less intoxicating trip. "Riding On Light" uses a kraut-inspired 3/4 groove to send us spiraling off into madness. Imagine if Suicide were actually best mates with Prins Thomas and Todd Terje and lived in the Nordic mountains; this might well just their jam! Finally, "Even So" ends on a emotional note, male vox crooning away supported by staccato keys while a simple drum machine rhythm holds it together. Very effective. Each sleeve is unique, hand-stamped and hand-sprayed with different colour schemes. A sublime release, and very limited copies available, so don't miss!